Rupert Pupkin Speaks: Twilight Time - THE BIG HEAT and WHERE THE SIDEWALK ENDS ""
"Like Robert Aldrich's KISS ME DEADLY (1955), Fritz Lang's THE BIG HEAT is a transitional film that links the hard-hitting expose films of the fifties (which were foreshadowed in 1948 by Abraham Polonsky's FORCE OF EVIL), and film noir, the dominant style of forties melodrama. True, Lang's film doesn't have the entangled relationships, the femme fatale who leads an unsuspecting hero down the wayward path, or the low-key photography that were hallmarks of film noir. But while it cooly surveys the the all-inclusive political/police corruption of a small city, it is equally concerned with the corruption of a decent man's soul. This is pure film noir. So is the film's pervading pessimism; it's ferocious violence; its lone hero in a corruptive universe; its hero making but one mistake - underestimating his opposition (as much as they do him) - from which there is no recovery; and, most importantly, its intertwining traits: fatalism and paranoia". I am personally a big believer in fatalism being one of the key elements of true film noir. The stock characters, the lighting and the other bits of the puzzle all take a back seat to fatalism for me. It is movies like THE BIG HEAT, OUT OF THE PAST and DETOUR that I learned this from. I really do feel like it is an essential component and take issue with some films being lumped into noir if they are lacking fatalism. 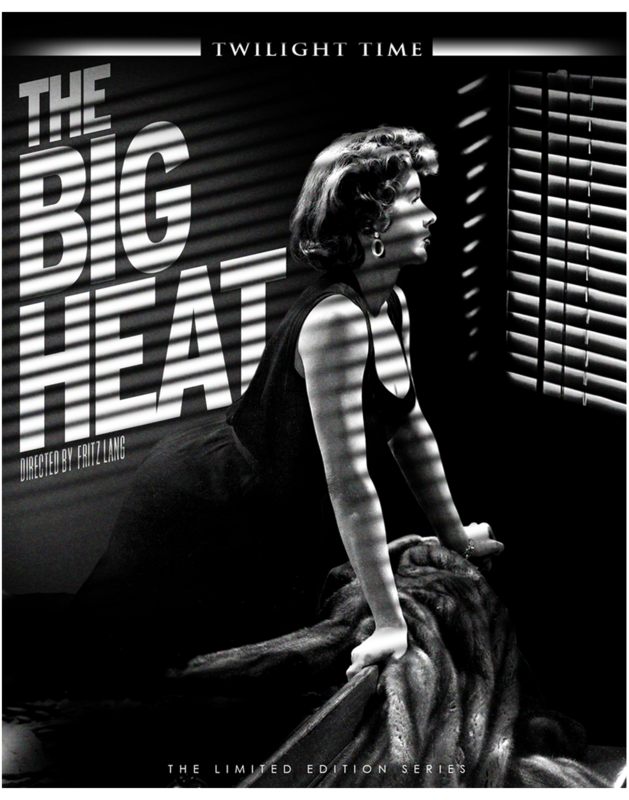 That said, THE BIG HEAT is on of those movies that has it at its core and never shakes it off. Dave Bannion is a good cop with a nice family, but his sense of idealism and the true justice and protection that a police department should be able to bring the the general public is problematic. It's problematic in that he himself finds the corruption he's seen evidence of to be too much and he decides to become a one man crusader against the city's biggest local criminal kingpin. Bannion's fatalism comes not from him being a loser who keeps getting himself in with the wrong folks (like Mitchum in OUT OF THE PAST or Tom Neal in DETOUR). Noir has told lots of stories of losers who can't get out of their own way and end up sabotaging themselves - often to death. Bannion's sense of right and his feelings of obligation to stand up to those who oppose that right is his fatal flaw. As Peary mentions above, he underestimates the bad guy here and it costs him. But what I love about THE BIG HEAT is that Bannion just keeps on coming. He's like a tenacious dog whose broken his leash and now wants to tear into those he thinks have wronged him. He won't be stopped by the bureaucratic chain of command that holds back his superiors. He may find that his pursuit of justice doesn't ultimately solve his woes, but for the time being it's invigorating to watch him take on the crooks who think they can control a small town with fear. One of Bannion's fellow cops tells him that, "No man is an island", but Bannion has to learn that for himself and it makes for a tense and crackling film noir. A noir that has some of my favorite lines of dialogue in the genre. I won't spoil them here, but Glenn Ford has some gems and this is probably my favorite performance from him. On top of Ford (and the film doesn't need anything else), it also has a young Lee Marvin in a memorable role as well as a great turn from Gloria Grahame. Marvin is perhaps most remembered in this movie because of an act of violence he perpetrates on Grahame. The whole film is a meditation on revenge and how the person seeking vengeance can easily become obsessed and begin to take on the traits of those that they are trying to retaliate against. It's one of those movies that is engaging and powerful in that it makes the viewer complicit in the acts of revenge that are being sought and yet it really just violence met by more violence. On is left feeling catharis, but not necessarily complete closure. 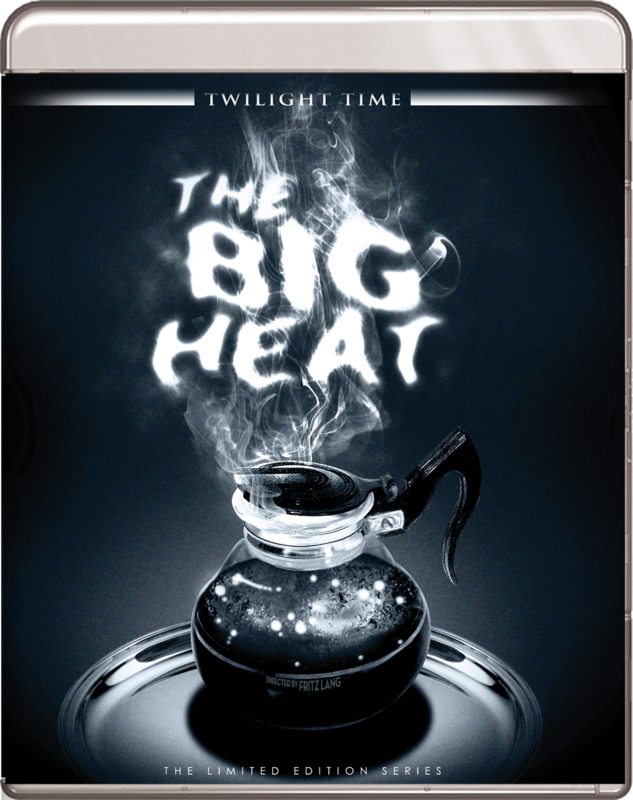 Note: For those that purchased Twilight Time's original release of THE BIG HEAT - this new edition has the below supplements that were not included on that disc (save for the isolated score track). -"Martin Scorsese on THE BIG HEAT" (6 mins) - Director Scorsese discusses his recollections of the film including the style (or lack there of) that Fritz Lang employed in this case and the role of destiny and fate in terms of the characters. I could listen to Scorsese talk about ANY movie so this is of course quite a treat. 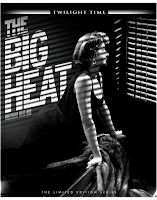 -"Michael Mann on THE BIG HEAT" (11 mins) - Director Michael Mann talks about German impressionism, Fritz Lang, corruption, the women in THE BIG HEAT and the influence of this film on his early work. -An Audio commentary from the Twilight Time team of Nick Redman, Julie Kirgo and Lem Dobbs. I've yet to hear a lackluster commentary from this crew and this one is no exception. As good or better than any Criterion track I've listened to. They talk about Fritz lang at length and his favoring of the theme of revenge and his use of women throughout his career. They also make a point to discuss the economy of the filmmaking in the movie and just how much is packed into its 89-minute running time. This one has a Danny Peary connection for me as well. Instead of Cult Movies though, I first saw mention of it in Peary's Guide For the Film Fanatic (which is my favorite book of all-time and a tome any cinephile should own). 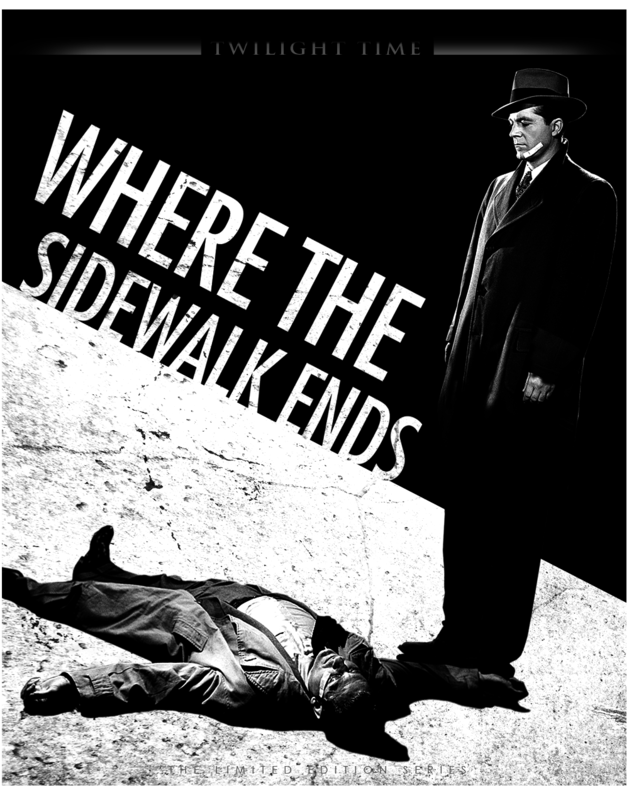 Eddie Muller calls WHERE THE SIDEWALK ENDS an example of "Bad Cop Noir". This of course has to do with the less than morally upright detective that Dana Andrews portrays in the movie. Andrews' Detective Dixon is a guy who has no qualms about ruffing up criminal types, much to the chagrin of his department superiors. He is in fact near the end of their good graces (his boss gives him a good talking too about the "ruff housing" at the beginning of the film) when he gets himself into much deeper trouble. In giving his usual "going over" to a suspect, he lays the guy out and ends up killing him accidentally. 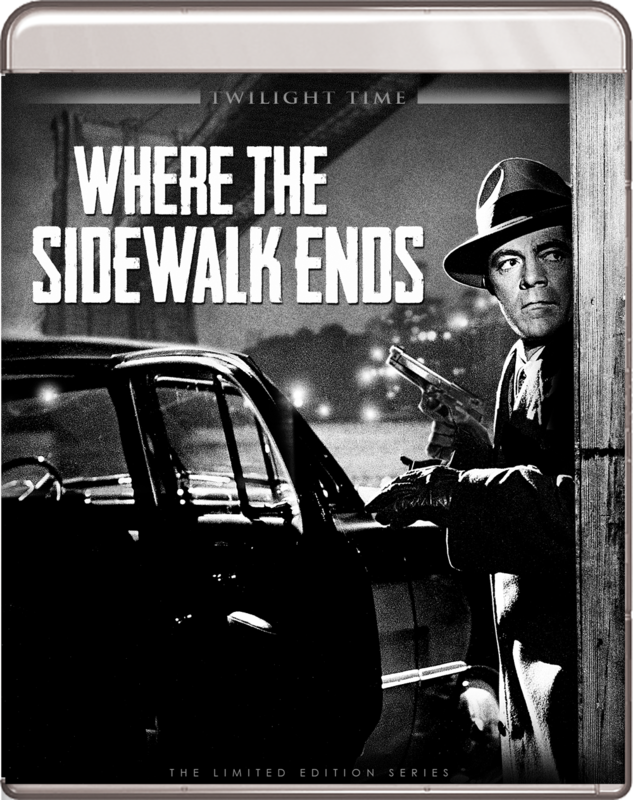 From there the plot twists and the tension increases as Dixon attempts to not only cover up his crime, but to also lead his Lieutenant (Karl Malden) to believe a local gangster is responsible. As you might expect, things are not as easy to pull off in the noir world as a dirty cop might want them to be. This is a neat little movie and an interesting quasi reunion for Preminger and his two of his leads from LAURA six years prior (Andrews and the lovely Gene Tierney). As with LAURA, Dana Andrews is again infatuated with Tierney's character and this leads to complications with his murder cover-up. 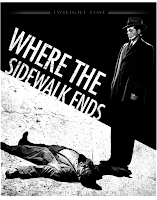 The script was written by the excellent scribe Ben Hecht (SCARFACE, HIS GIRL FRIDAY, TWENTIETH CENTURY, NOTHING SACRED) and it is certainly a better film for it's plotting and dialogue. In this case, the style on display in the film is less with the wordplay between the characters, and more with the camera. Preminger was very much into camera movement within a scene rather than hard cutting. You can see how his tracking shots and blocking could easily have influence directors like Martin Scorsese in later years. While Preminger is often more subtle with his camera in terms of moves that call attention to themselves, he still had a great deal of pinache in his filmmaking techniques. I like this movie because it lives in the shadow of LAURA and though it is not as good as that film, it is a very solid noir and one that is still deserving of more attention. Like THE BIG CLOCK (later remade as NO WAY OUT), it has some nice suspense to it derived from knowing what Dixon has done and how he is running out of time to make sure he is not caught. It's all very Hitchcockian and those who are fans of his will undoubtedly enjoy this gritty little bit of business. -An Audio Commentary from Eddie Muller. Muller is about the best guy you can have on a commentary like this as he is a true film noir guru and has a vast and effortless knowledge of the genre. His encyclopedic awareness of each of the actors (even bit players), and all the crew members and studio politics are always incredibly enlightening. At one point he says, "If LAURA is the penthouse, then WHERE THE SIDEWALK ENDS is the outhouse", which is just one of many astute observations he makes throughout this track. In this case, he is comparing the class of people that are the main characters in each of those films and WHERE THE SIDEWALK ENDS is decidedly dealing with some not so classy people. This is a great track and a short master class in all things having to do with this movie. Great article. Of course I knew The Big Heat but I have to say the other film sounds very good too.